Thank you to our alumni, who not only recognize the great talent to be found within UM, but who also reach out to bring students into their networking circles, stand as examples of successful career professionals, and who donate both their time and money to make sure we can continue to give students the best possible entrance into the business world. COB alumni are more than welcome to attend Career Development Events & Programs. We offer exceptional opportunities to gain experience and find a job. Browse our Career Tools for advice on resumes, cover letters, interviews, and more. Are you on LinkedIn? Sign up and join our UM COB Alumni Network, where you can connect and create valuable relationships with important people. The University of Montana offers so many resources for alumni on the UM Alumni Homepage. Also, the University of Montana Office of Alumni Relations has a House of Delegates which consists of representatives from across the U.S. and Canada to assist in outreach programs. Want to meet up with fellow Griz fans across the country and reminisce over old times and have someone to watch the Griz take on the Cats? Join Griz/Cat Satellite Gatherings and keep in touch with the Griz in you! The Montanan is the official magazine for the University of Montana and is a great way to keep informed on all the happenings on campus and around town. COB alumni are among some of the top recruiters who visit UM. 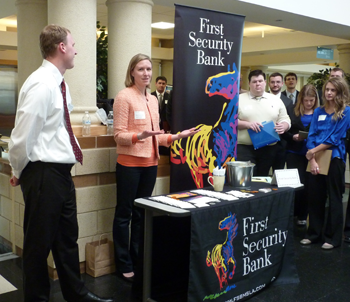 In spring 2013, 57 COB alumni, representing 39 companies, entered the GBB to participate in COB Career Development events. You can mentor students through many of our workshops, networking events, class presentations, etc. Support the COB Career Development Program through a donation. (Many companies offer matching donations.) Each year, we rely on donors to support 100% of the Career Development Program budget.